The Q&A (question-and-answer) feature in Skype for Business provides a structured environment for answering questions during a meeting. This feature is especially helpful in large meetings where a presenter can answer questions, while someone else is presenting meeting content. Any of the presenters in a meeting can start the Q&A session and reply to questions. If you are attending a meeting and are not a presenter, see Participate in the Q&A session as an attendee. Click More, and then click Q&A. If there is no other content presented, the content stage opens and displays the Q&A session for all participants. If other content is active, the Q&A tab displays as a new tab next to the Presentation tab at the bottom of the Q&A window. 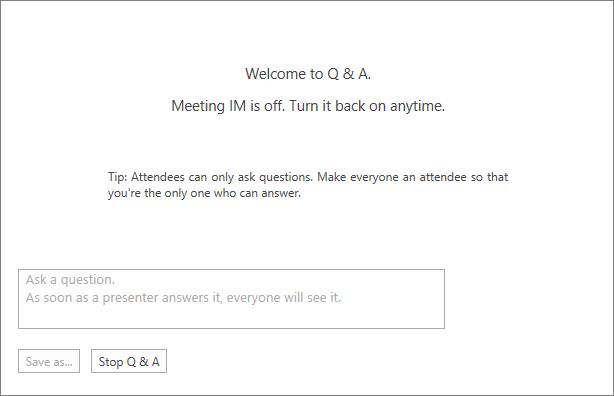 The meeting IM is automatically turned off until you stop the Q&A session. When a question has been asked, you will see an All tab and an Unanswered tab at the top of the Q&A window. Click the Unanswered tab to filter for the questions that haven’t been answered yet. At the end of the session, click Stop Q&A. 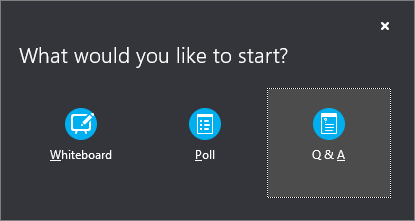 When Skype for Business asks if you want to enable IM, click Allow All Meeting IM, or click X on the notification if you want to keep the IM off. To have a local copy of the questions and answers, click Save as, and select a location on your computer.